Using this feature, customers with European subsidiaries can now have the ability of printing a detailed summary view of VAT amounts in their invoices. 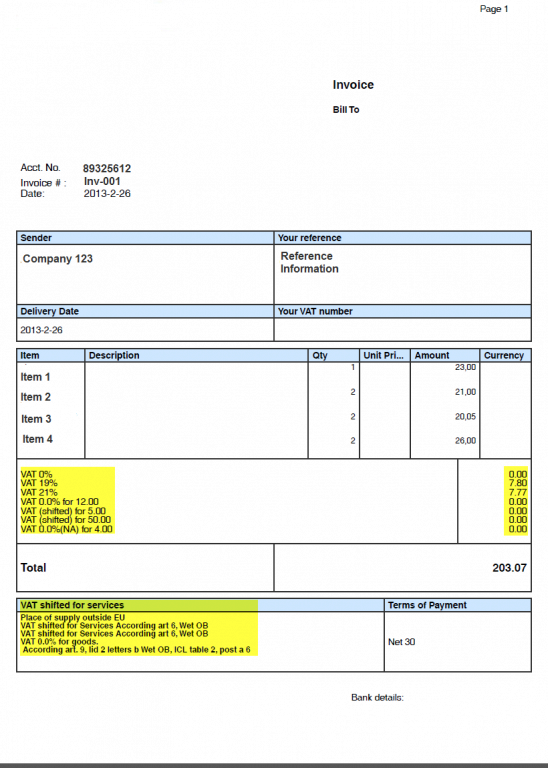 Standard layouts provided by NetSuite do not support a full summary drill down of the VAT codes and amounts applied in the transaction; however using PDF Invoice Layout (VAT) a user can now have this breakdown in their standard NetSuite Invoices. Optimization of existing code to support customer "VAT" codes. Script that creates a summarized view of the VAT codes and amounts applied in a transaction. Uses NetSuite standard PDF Forms (does not require XML to PDF). The user simply needs to modify their layout using the PDF GUI Tool provided by Netsuite. Updated code to match the user's VAT codes.